Close Word and any other Office programs. You should do so now; otherwise, you’ll be asked to do so again later. Press the Win+X keyboard shortcut. In Windows 10, the Windows-and-X key combination brings up the super-secret shortcut menu in the lower left corner of the screen. If you’re using Windows 7, just click on the Start button. Below the Programs heading, click the Uninstall a Program link. Don’t freak out: You’re not uninstalling Word. The link should read “Uninstall or Change a Program,” which is the title of the Control Panel screen you see next. Select Microsoft Office from the list of programs. The name may be subtly different, such as Microsoft Office 2016 or Microsoft Office 365. 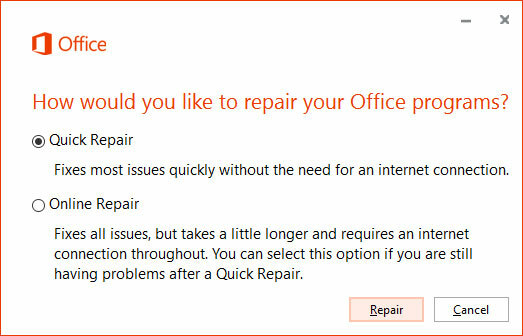 The Office Repair utility runs, showing a screen similar to the one shown here. If this choice doesn’t work, go back and choose Online Repair when you try again. Click the Repair button again to confirm. The Office Repair utility attempts to figure out what’s wrong. What happens next depends on whether anything is fixed. If something needs attention, obey the directions on the screen. If everything is fine, you see the Done Repairing message (even if nothing was actually wrong). If the repair didn’t work, try again but choose Online Repair in Step 8. If that doesn’t work, consider reinstalling your Office installation.